October 29, 2018, 1:42 AM · William Preucil Jr. -- you might have heard the name recently in the news, when he was fired as concertmaster of the Cleveland Orchestra after an investigation that found evidence of sexual misconduct. But you also might know his name from a different place -- the cover of the Suzuki Violin School recordings. He is the violinist on all the listening reference recordings to accompany the Revised Books 1-8 for violin. In August, after the Washington Post article that put years of rumors about Preucil's problematic behavior further into public light, the Suzuki Association of the Americas released the following statement: "In light of recent allegations of misconduct, the Board of Directors of the Suzuki Association of the Americas has removed William Preucil, Jr. as an honorary board member. As an association, working together as Dr. Suzuki intended, we will continue to aspire to the highest standards of personal conduct, professional integrity and respect for human dignity." As a longtime member of the SAA and a Suzuki teacher for more than 20 years, I was heartened by this acknowledgement, as were many of my colleagues. But will it be enough? Here is why there is so much at stake for the Suzuki world, when it comes to the recordings that it recommends and embraces. For some background: the Suzuki Philosophy, devised in the mid 20th century by Japanese violin teacher Shin'ichi Suzuki, is founded on the idea that children can learn instrumental music in much the same way as they learn their native languages. One important part of language acquisition is an environment filled with spoken language; similarly, the Suzuki philosophy advises that children have an environment filled with music. To that end, Suzuki teachers have always required students and parents to listen to recordings of the music they are learning to play in the Suzuki books. The violin recordings were first made by Suzuki himself, and subsequently by other violinists, including Koji Toyoda, David Nadien and David Cerone. The recordings are meant to model the best-possible music-making and good violin tone. As Suzuki himself said, "Beautiful tone, beautiful heart." For Suzuki, building good tone and cultivating a sense of beauty were ways to help children build good character. This remains an important ideal for Suzuki teachers today. Shin'ichi Suzuki died in 1998, and the beginning of the 21st century, teachers from all over the world met in committees, through the International Suzuki Association (ISA), and worked through a series of major revisions to the Suzuki Violin School volumes (there are 10 in the violin series, and all but Vol. 9 and 10 have been revised). It was a years-long, arduous process involving many people, and many hours, going over bowings, articulations, dynamics, style -- everything. Once the music was revised, Preucil Jr. -- who is the son of longtime teachers and Suzuki pioneers Doris and William Preucil Sr. - was asked to record the music. The elder Preucils were involved in the revision process as well. The recordings were supervised by an international committee of Suzuki teachers, many who actually attended the sessions to oversee the many pedagogical details. They did many, many takes of every piece -- for example, 27 takes of all the Twinkle variations. 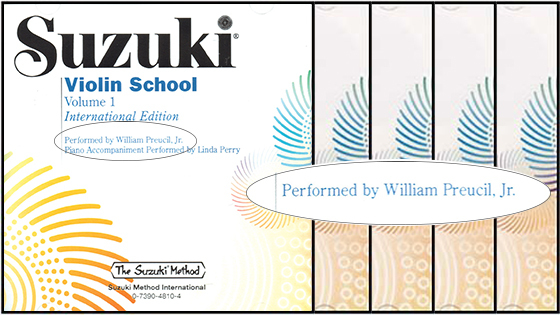 Since their release, Preucil Jr.'s revised recordings for Books 1-8 have been officially designated by the ISA as the recordings that Suzuki teachers are obliged to use and obliged to recommend to their students, putting the name "William Preucil Jr." on thousands of CDs all over the world and putting it in very close association with the "Suzuki Violin School." Considering the recent revelations over longstanding scandals, having the name "William Preucil Jr." on every child's Suzuki recording may not be a tenable situation. Incidentally, the eight recordings were released over a period of years, from 2007 to 2016. Preucil Jr.'s character was first publicly questioned in 2007, in a Cleveland Scene article entitled Sour Notes, which outlined allegations of sexual misconduct and nepotism. The article circulated nationally and in fact elicited a lively discussion here on Violinist.com at the time. Now more than 10 years later, allegations of sexual misconduct by Preucil can no longer be brushed aside as hearsay. On Tuesday the Cleveland Orchestra released a full independent investigation report (read it by clicking here.) that confirmed 12 incidents of sexual misconduct during Preucil's 23-year tenure as concertmaster of the Cleveland Orchestra. A number of Suzuki teachers, whose careers are built on the reputation and integrity of this method, are clearly concerned about the recordings. Chicago-based viola and violin teacher Sarah Montzka started a blog called Character First, and a number of teachers have written essays on the site, in support of creating new recordings. "I have grave concerns that William Preucil Jr.’s continued association with the Suzuki brand (through the recordings of the Revised and new International editions) will bring immeasurable harm to the name and legacy of Dr. Suzuki," wrote Plano, Texas-based Suzuki violin teacher Charles D. Krigbaum. "We live a philosophy that says beautiful tone, beautiful heart — and that who you are inside comes alive in your sound. I believe this with all of my being, and therefore I cannot personally use or recommend these recordings in light of the recent allegations. Yet these recordings are the only recordings that reflect the revisions of the last decade." A parent responded to a recent article here on Violinist.com that "I have never been able to bring myself to allow my child to listen to his Suzuki reference recordings, despite the excellent playing. I wonder how many other Suzuki parents have this conundrum." With so much time, money and the talents of many people invested in these recordings, there may be some resistance to re-recording all the volumes. To do so would be an international undertaking, requiring leadership and permission from the International Suzuki Association and Alfred Publications, which together hold the rights to the Suzuki recordings. the Cleveland Orchestra for sexual misconduct, this was national news. When the rest of the world makes the connection that the musical voice of the Suzuki method is also known to be a sexual predator, the International Suzuki Association had better have a plan to save the community's reputation. Because to continue to ignore this problem is to put that hard-earned reputation at grave risk. EDITOR'S NOTE: Alfred Music has announced that they are "in the process of working with the ISA on commissioning and releasing new recordings with a new artist in 2019." Another source is Suzuki Evergreens, played by violinist Takako Nishizaki and pianist Terence Dennis. Here is a link for Spotify. In September, the Suzuki Association of the Americas also put out a list of Additional Recordings for the Suzuki Violin School. October 29, 2018 at 07:43 AM · It's time the ISA just put together a centralized global site with ALL of their recommended recordings available by subscription service, with supporting services for generating physical media for locales that do not have Internet access. Then, they can also create a service where teachers and performers can submit their own recordings for evaluation (and maybe voting by SAA members?) to be added to a collective pool of recorded resources. There is no good reason to insist on a single "canonical" recording for any of the books, and past book 5 it doesn't matter anymore because so many professional recordings of the standard repertoire are available on iTunes, Amazon, etc. October 29, 2018 at 12:44 PM · I'm with Gene, entirely. I would only add that maybe the SAA could also curate a list of YouTube videos they consider to be representative of what each piece is meant to convey technically and musically. Or, the winners of various competitions could be invited to contribute youtubes or audio tracks. I still use my Frugal Gourmet cookbooks. October 29, 2018 at 01:16 PM · Alfred Publishing owns partial rights to the recordings. They aren't going to just give up a huge cash cow and let the books be accompanied without the CD's. The obvious and simple answer, maybe not the best financially, is just to be honest and make things right. Put out an official statement and re-record all CD's. Alfred stands to lose a tremendous amount of sales and in conjunction put a huge burden on the SAA if together with ISA don't make things right in a timely manner. The actions of Preucil won't have an effect on Suzuki's legacy, nor the quality of education students receive. Suzuki method is a philosophy not to be tied solely to the books or recordings. October 29, 2018 at 01:39 PM · As a former Suzuki child, I grew up listening to all of William Preucil's cds and pretty much idolized him. Because of what he did, I am very disappointed and would hope to find better alternatives to his recordings. October 29, 2018 at 02:12 PM · That fact that thousands of students the world over are being told that one specific recording and way of playing should be THE model for the pieces is itself a repugnant concept to me. This is less like music making and more like factory production of widgets. October 29, 2018 at 04:03 PM · I would have a problem if Preucil is still getting royalties from his recordings, which I assume he is. October 29, 2018 at 04:15 PM · Things people create can have a life of their own. Richard Wagner was a prototype Nazi, philanderer, etc., but I'm not inclined to dustbin his works. I have cd's of great music conducted by James Levine. I'm not inclined to throw those out either. It's like a therapist once said to me, "People are complicated." October 29, 2018 at 06:37 PM · William Preucil Jr.'s actions should not be endorsed in any form I agree and he lost his prestigious job over it, however, I doubt that many Suzuki students, if any at all, will make the leap that listening to his recording equates to an endorsement of his unethical sexual behavior. I understand the feelings at work with the #metoo movement and all, and I understand the disappointment of those who idolized him, but a condemnation of the man's entire body of work as a consequence of his unethical behavior is perhaps a bit of an over reaction. Surely over times other renowned artists have done not so ethical actions of their own, suffered the consequences and yet their body of work wasn't trowned into the fire. October 29, 2018 at 07:16 PM · I think people should leave it to their conscience whether they want to use the materials. I don't listen to Maurice Gendron, even though he was an excellent cellist, but if people want to listen to him, more power to them and no judgment from me. I'm also not going to listen to Wagner, but that's just a favor I do for myself. October 30, 2018 at 12:49 AM · It is a terrible shame to have all works by a fabulous violinist banned. Those who don't understand, the project to revise the Suzuki books and take out wrong notes, edit bowings, etc. took years and an international committee. Someone needed to record the 'new' books. I am at such odds knowing Preucil and his family, such stalwarts in the Suzuki movement. I also think about the many fabulous, grammy award winning recordings of Beethoven quartets he made. No, that does not excuse the behavior. Just a perspective. His accusations were brushed aside in 2007, and what's interesting is that, 11 years later, they brought him down. October 30, 2018 at 01:01 AM · I am conflicted with eradicating a body of work from a fabulous violinist. He is the best of what the Suzuki movement produced, from a performance standpoint. His Beethoven string quartets won Grammy's. There was a huge movement to revise the Suzuki books, and he recorded them (at great expense and time for the committee) over the last 10 years. Just some history. It doesn't excuse any of the problems. Take his name off the recordings? To re record is huge. October 30, 2018 at 02:47 AM · The Suzuki movement has produced many fine violinists. Two names that come immediately to mind are Brian Lewis and Anne Akiko Meyers. October 30, 2018 at 03:24 AM · Hilary Hahn was a Suzuki kid too. At least initially. I think. October 30, 2018 at 05:13 AM · There are some beautiful recordings of the Suzuki repertoire Book 1 through 5 published by Alfred, in the Step by Step publications for book 1-3, and Recital Training for Book 4 and 5. Most of them are played by Rudolf Gähler and 3 more violinists. I use those all the time for my students, I do not give them the ones by William Preucil, because I always consider those at a too high speed for my students to model. October 30, 2018 at 12:34 PM · I don't think we must to destroy the great work of art of bad people. We should separate both. ¿Writers, painters, filmakers...? There is often a lot of evil in the talented people, in the geniuses. On the other hand, seeing the name of this man printed in Suzuki's work seems to me deeply inappropriate and make me feel uncomfortable. October 30, 2018 at 01:01 PM · I am Suzuki teacher in Europe, and this whole thing has'nt been in any news in European Suzuki association or in any community. Nobody talks about it. At least I have'nt seen or heard. I just wonder why. It should be at least some kind of issue to be worried about, I think. Scored pieces for airplane engines, player pianos, etc. October 30, 2018 at 03:40 PM · Heavens to Betsy, how will Debussy ever live down writing all those SCANDALOUS pieces! October 30, 2018 at 04:09 PM · I think the teachers are right to be concerned about the Suzuki recordings in particular, because they are used by children. I agree with Gene and Paul that it would be good to have a curated set of good, diverse recordings for students to listen to instead. (My teacher always told me to listen to 3 different recordings of a piece). Adults can listen to Preucil's body of work and take the good from it and leave the rest. Or not listen to it, as they choose. As others have pointed out, Preucil isn't the first great musician to have done reprehensible things in his personal life and listeners decide what relationship, if any, they are comfortable having with the music created by these people. For that reason--that great musical talent and skill are not necessarily connected with or signifiers of good character--I simply don't believe in the "beautiful tone, beautiful heart" philosophy. I find the philosophy off-putting and unhelpful in learning or teaching the instrument. If this unfortunate situation brings about some soul-searching and rethinking of the value of that philosophy among teachers, maybe some good can be gotten out of it. October 30, 2018 at 05:52 PM · I appreciate the idea of separating the artist from his or her art, but in this case I think the choice of artist to do the recordings is very much a "branding" decision. Ironically enough, a likely reason that Preucil was chosen for this was precisely because of his "good name," which evokes his parents, Bill and Doris Preucil, and their devotion to their students and to teaching another generation of teachers. And Preucil himself was concertmaster of the Cleveland Orchestra, widely known for his excellent playing. These all seemed like excellent reasons to marry the brand "Suzuki" with the name "Preucil." It just no longer applies, and with so many wonderful and diverse musicians out there, the Suzuki Association could take the opportunity to put together something quite inspiring. Karen, I don't think that Suzuki teachers need to put aside their ideal that learning music can help people to develop good character. Suzuki came up with his ideas about music education after seeing the horrors of WWII. He wanted to put violins in children's hands instead of guns. Music is a very unifying force for humanity, and so there is a certain dignity in teaching music, in the discipline of practicing music, and in playing music together. I will always teach that, whether my fellow musicians prove to be ideal humans or not. October 30, 2018 at 06:53 PM · Laurie, I think we will just have to agree to disagree; this is not the place for me to rehash my negative experiences with and feelings about that philosophy in general or Suzuki in particular. I will say that we are in agreement that music is a unifying force for humanity and that there is a dignity in playing, teaching, and learning music. We may diverge in our opinions about the role that branding, role modeling, and "heroes" should play in those activities. I did not say that teachers should necessarily put aside an ideal that learning music can help people to develop good character. I said that the value of the "beautiful tone, beautiful heart" philosophy would benefit from being rethought. One potential re-thinking would be to allow for students to develop their own ideas of what makes a beautiful tone, based on a more diverse group of recordings. Another potential rethinking would be to say that the study of music is one path of many that can help people improve their character. Music has religious roots, and like religion, it can suffer from one-true-path-ism and fundamentalism. As much as we all love music, it should be acknowledged there are other paths to to a beautiful heart. The re-thinking that I believe would be the most helpful is a decoupling of views of character from personal, individual achievement, whether it's in music as in this case, or in sports, business, academics, or other. The content of people's character depends on kindness and on how they treat others, not on how beautiful they sound. October 30, 2018 at 09:16 PM · Of course character depends on many different things. It's all about context. So is "beautiful tone, beautiful heart," it's one of a zillion things that Suzuki said that add up to a philosophy that has inspired hundreds of thousands of people. And no, it is not a religion or a cult, and yes, people have many different approaches to it, including listening to many recordings by many artists. But the Suzuki organization, which represents a community of teachers, needs to decide with care what it sanctions. That is what I'm arguing here. October 31, 2018 at 05:24 AM · I agree strongly with Mark Bouquet. The musical abilities of a composer or performer should be considered separately from the ethics of his personal life. Mark Bouquet's example of Richard Wagner is a very good one. Even re Wagner, though, there are different opinions. Many Israelis object to live performances of Wagner's music out of respect for Holocaust survivors even though Israeli radio stations play recordings of Wagner's works. Since my feelings about Wagner are not that personal or intense, I listen to Wagner's music and sometimes even enjoy it. October 31, 2018 at 01:25 PM · In our society, everyone can make their own decision. I know what I would do, but that's irrelevant. These recordings, although they may be teaching tools, are also products -- the marketplace will sort this out, as both Alfred and the SAA have determined. October 31, 2018 at 05:20 PM · I also agree with Mark Bouquet's comment and the quote from his therapist he posted. We are all dark and light. Throwing the baby out with the bathwater isn't necessary if the work stands on its own. This is true beyond the musical world. November 1, 2018 at 05:11 AM · While I don't agree that the accusations against Preucil are admirable (if they are all completely true) I think we might be in for a rude awakening if we knew more about the private lives and yes, moral lives of many of the musicians we have esteemed over the years. We just don't always have opportunity to hear about it. I have learned some things about many that if that determined if I would listen or not, my library would be amazingly small. We live in a time of history where anyone in the public eye gets micro-managed. I do believe, which I actually learned from my studies with Linda and David Cerone that it is advisable to listen to more than one recording of any given piece and as a Suzuki trained teacher for many years, we would do well to encourage that.